I’ve never been a big fan of Activision Blizzard, Inc. (NASDAQ:ATVI) stock. For all the hype behind ATVI stock — stemming from category growth and the margin-enhancing shift to digital downloads — I still see reason for concern. Two key franchises — World of Warcraft and Call of Duty — are getting long in the tooth. As such I’d look elsewhere in the gaming space before choosing Activision stock. Of course, I’ve been mostly wrong so far when it comes to ATVI, and in January I listed three reasons why that might continue to be the case. If so, ahead of Q1 earnings on Thursday afternoon, with Activision stock down 17% in less than two months, ATVI bulls have an opportunity. After all, Activision Blizzard has a long history of beating earnings (and a clear strategy of providing conservative guidance). Investors are going to be focus on the impact of Fortnite on usage and unit sales. If that competitive effect is less damaging than feared, ATVI could see a nice post-earnings rally. Again, I still have questions about Activision stock long term. I still believe it costs too much for too little growth. But those with a different outlook — or traders looking for a bet on earnings — should take a long look at ATVI stock this week. Whether ATVI is ‘on sale’ heading into Thursday’s report probably depends on an investor’s perspective. ATVI has pulled back about 17% from its highs. But that pullback came after a sharp run upward. ATVI stock still is up ~4% so far this year and nearly 27% over the past twelve months. And there has been some pressure on the sector of late. Whether it’s the huge success of Fortnite (owned by privately held Epic Games) or just valuation/growth concerns, ATVI hasn’t been the only gaming stock to pull back. Electronic Arts Inc. (NASDAQ:EA) is off 10%+ from its highs. Take-Two Interactive Software, Inc (NASDAQ:TTWO) has declined some 23%. Still, from a sentiment standpoint, it’s hard to argue that expectations are high for the Q1 report on Thursday. That looks true fundamentally as well. Activision’s guidance, net of required deferrals under GAAP accounting, forecast $1.28 billion in revenue and $0.31 in adjusted EPS. That suggests about 7% revenue growth and ~flat EPS. Activision for years now has guided low, and so the Street has moved higher. But even consensus of $1.32 billion and $0.35 in adjusted EPS looks a bit light. ATVI hasn’t missed the Street in over two years now. So there appears to be a good chance of an earnings beat on Thursday afternoon. And with Activision stock off its highs, that could set up at least a bit of a ‘relief rally’ coming out of the quarter. 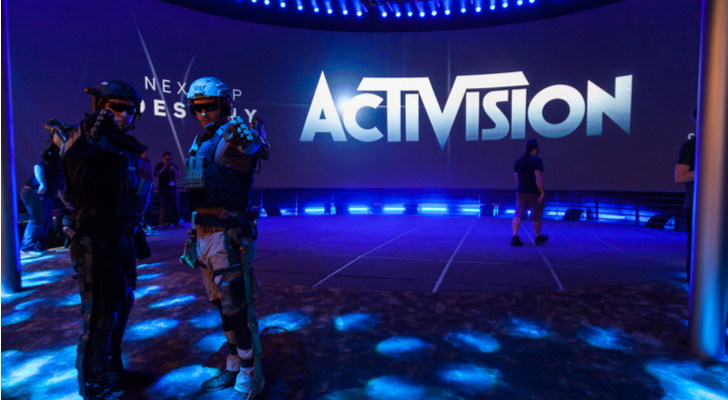 It’s not hard to imagine headlines reading “Activision Blizzard shakes off Fortnite threat” — and investors buying up ATVI stock as a result. In the longer term, I’m still not sold on ATVI — and I doubt the Q1 report will change that. Activision’s earnings growth has been rather muted over the past few years, despite the tailwinds in its space. And per the 10-K, four games drive two-thirds of revenue: WoW, CoD, Candy Crush, and Overwatch. Overwatch aside, that’s a mature, low-growth portfolio on the whole, with Warcraft revenue declining according to that filing. But at 22x forward EPS, ATVI stock still trades at a multiple pricing in quite a bit of a growth — which has to come from essentially less than half of the portfolio. And with the declines of late in the sector, I’m hard-pressed to see ATVI as the best pick. I already thought TTWO was the best play in gaming, and below $100 it looks even more attractive. There’s a case for EA as well. I’m not interested in chasing GameStop Corp. (NYSE:GME), given its lack of exposure to the same digital download trends benefiting publishers, but of those publishers ATVI still looks like the weakest choice. But that doesn’t mean ATVI is a poor trade — and, again, I could be wrong. Results from Zynga Inc (NASDAQ:ZNGA) and recent sales in the social gaming space by Caesars Entertainment Corporation (NASDAQ:CZR) and Churchill Downs, Inc. (NASDAQ:CHDN) show that space may have more legs than originally thought — which benefits Candy Crush. eGaming is a real driver as well. I still believe those positives are priced in. But for those investors who disagree, buying Activision stock ahead of Thursday’s earnings report looks like a smart play. Article printed from InvestorPlace Media, https://investorplace.com/2018/05/like-activision-blizzard-inc-stock-buy-earnings/.